Congressional District 35 runs from Austin to San Antonio. And as Ben Philpott of KUT News and the Tribune reports, that means candidates — including longtime U.S. Rep. Lloyd Doggett — must weigh the concerns of various constituencies in their bids for the seat. Redistricting has divided Travis County into five congressional districts, including CD-35, which runs from southeast Travis County down to northeast Bexar County. The district, some say, was created to elect a Hispanic Democrat. 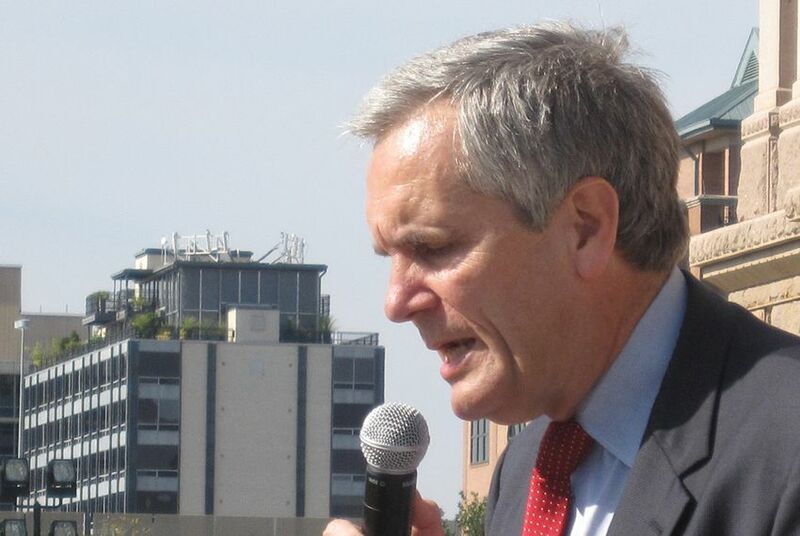 In 2004, after years of representing a district based in Travis County, Democratic U.S. Rep. Lloyd Doggett was re-elected in a newly drawn district that ran from Austin to the Mexican border. He had a new map and new district in 2006. Six years later, he's running in CD-35, yet another new district. "That was the whole idea of Gov. Perry, was to shift me to as many people as possible who had never dealt with me before,” Doggett said. “And to deny as many of my neighbors an opportunity to participate in this election." Most of the new district and its voters are new to Doggett. Travis County only makes up 30 percent of the district’s population. That means San Antonio voters, especially Hispanics, can put their stamp on this election. Enter Bexar County Tax Assessor-Collector Sylvia Romo, who's hoping support in her hometown will help her win and expand the diversity of the U.S. House. "Out of 435 U.S. representatives, there's only 76 women,” Romo said. “Out of 435 there's only 26 Latinos. Out of 435 there's only 42 African-Americans. Out of 435 there's only seven Latinas." But in this unusual primary, with Election Day right after Memorial Day and voter turnout predicted to be low, she knows she'll need help from Austin, too. And has made several trips to town to tell voters that even though she's from San Antonio, she understands the people of East Austin. "You go to East Austin and I feel like I'm in San Antonio,” she said. “Quite a bit, the population mirrors San Antonio. So their needs are going to be pretty much the same." Doggett is playing the same game, but in reverse. He's making sure to tell his supporters in Austin it’s a close race. And he's letting the voters in Bexar know he's ready and able to help. "The issues that I've been most involved with in the past, like education, like protecting retirement security, those are issues that transcend any lines," he said. The third Democrat in the race, Maria Luisa Alvarado, was the Democratic candidate for lieutenant governor in 2006. She hopes that her military background and work with veterans will appeal to military families in San Antonio. She also wants to increase access to health care for veterans in South Texas. "We have veterans who have to travel this distance,” Alvarado said of the fact that there is only one VA hospital between San Antonio and Brownsville. “They're handicapped, they have to travel, they're really sick. Then there's a matter if there's any money to pay them to compensate them for their travel. In the course of care, there's just so many things." Alvarado, who lives in Austin, acknowledges the demographic makeup of the district and knows it was created to allow minorities to select the candidate of their choice. But she wouldn't say that disqualifies Doggett. "I don't know [if it needs to be a] Hispanic necessarily,” she said. “It was an opportunity for a new voice, and that's what I am. As far as my other opponent, well, she's from San Antonio and probably more aware of what's going on in Bexar County but not in my neighborhood either." The winner of the Democratic primary will face a Republican, a Libertarian and a Green Party candidate in the fall.